Yay! One of my absolute favorite online casinos has just launched a new one of a kind game! 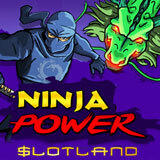 This week Slotland, which recently celebrated its 18th birthday, introduced their new Ninja Power slot and until December 15th you can get a $12 free chip to try it out. Ninja Power is a 40 payline, 5x4 slot with sticky Wilds, instant prizes, and free spins. Its local jackpot can grow up to $5000. Slotland creates all of their own games so you won't find this one anywhere but Slotland.eu. Japanese anime style characters use their shuriken, nunchacku and katana samarai swords to fight the dark forces. The wild symbol is a fiery dragon. It can spin into place on any reel, or a ninja can throw them onto the reels. During free spins, they’re Sticky Wilds. Ninja scatter symbols pay out instant wins multiplying bets up to 50X. When 3 or more Bonus scatter symbols appear, the Bonus round with 10 Free Spins starts. Hitting three scatters during free spins re-triggers more free spins – up to 30. During Free spins the Ninja can use his super power to nudge one or more reels and to throw in more wilds to improve a winning combination. The new Ninja Power slot has its own jackpot for those who're willing to take their chances and up their bets. The Dragon Jackpot can grow to $5K and is re-set to $500 every time it’s hit. $12 free chip available until December 15th to try new real money online slot game. Bets are made in “coins” valued at $0.01 each. Players can bet 40, 120, 240, 400 or 800 coins ($.40, $1.20, $2.40, $4, or $8) per spin. A max bet must be placed to win the Dragon Jackpot. These bonuses to be played on Ninja Power only. May be played on any slot or progressive jackpot game. Lower 6X wagering requirement. May be redeemed up to three times a day. May be played on any game. All bonuses valid December 8 – 15 only.